16 Commercial Real Estate & Properties in Burswood are listed in 3 categories. We have 12 OfficesSale & Lease , 2 Industrial Warehouses Sale & Lease and 2 ShowroomsSale & Lease . Abundance Of Natural Light | Regular Cleaning | Transport Close By $184pw | 2 Person Workspa..
PROPERTY OVERVIEW $184pw Price incl. 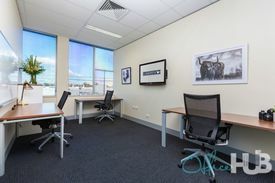 Brand new serviced office in convenient Burswood with fab meeting facilities and a range of flexible options. Set to open its doors in August 2018, this coworking centre comes from a local provider that has grown into one of the city’s leading office specialists, best known for its impeccable customer service. This refurbished and light filled centre comprises private offices, coworking desk spaces and three purpose built meeting rooms that you can book by the hour or day. 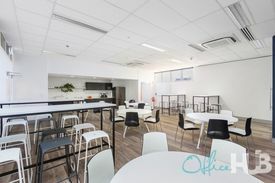 There is a generous breakout and collaboration space which encourages organic networking and collaboration with some of Perth’s brightest minds. Included with the space as standard is personalised call handling and corporate grade internet while you also have access to printing, conferencing equipment, networking events and business support services. Short and long term options available on flexi terms so your space can grow with you – book a tour or contact Office Hub and we’ll help you get the best deal on your chosen space. This convenient location on Burswood Road hits the sweet spot of being close enough to the city that clients are always within reach while also having good parking options and easy road links. Burswood is a high growth area and this quality 3.5 Star NABERS Energy rated building enjoys a prominent position opposite the BMW showroom. Recently refurbished, everything feels fresh and new including the great facilities of showers and bike racks. Drive just five minutes or hop on a bus at Victoria Park bus station and you’ll be right in the middle of Perth close to multinational corporations, resource firms and innovative startups in the city’s vibrant business scene. Optus Stadium and Crown Resort & Casino are also only five minutes away and the Canning Highway provides a direct route to Fremantle and the Freeway. Perth International & Domestic Airport is 9km away and serviced by a regular 30 minute shuttle bus making this space perfect for frequent business travellers. The advertised office space is perfect for a team of 2. If you need more or less space, we have over 30,000 furnished workspaces all over the world suitable for a team of 1 to 200+. Our award winning team offer a free service that will help you find the perfect solution for your needs, so reach out if you need more help. What you get for your weekly rent , 24/7 Access , 24/7 Security , Access to internal breakout areas , Access to kitchen facilities , Access to secure printer and scanner , Building outgoings included , Electricity usage included , Flexible terms , One simple bill for everything related to your workspace , Plug and play furnished workspace , Regular cleaning , Secure high speed Internet , Your own receptionist and waiting area for your clients Building features , Abundance of natural light , Air conditioning , Car parking in building (Paid) , Company branding in foyer , Disabled access and facilities , Onsite Cafe / Restaurant , Print, scan and copy facilities , Taxi / Uber stand close to building 600m to Telethon Community Cinemas Burswood 300m to Charles Paterson Park 270m Burswood Seafood market 1.1km to Burswood Railway Station & 1.3km to Victoria Park Railway Station 4.3km to Perth CBD WHO IS OFFICE HUB? Office Hub has largest collection of shared office space, sublet office space, creative coworking office space and serviced offices, perfect for 1 200 employees. Let us take you on a tour of all the spaces that fit your needs and budget. Our service is complimentary and we work for you and the landlord to negotiate the most competitive deal in the market. Let us show you how shared and serviced offices can be the perfect solution for your business. www.office hub.com.au www.office hub.co.nz Conditions apply A portion of the square meterage factors in access to shared space. The advertised price includes any incentives offered based on a 12 month agreement. If a shorter period is agreed to please note the price may increase accordingly. This promotional offer for new tenants only and may be withdrawn at any time due to space availability. Convenient Location | Coworking | Fully Furnished $92pw | 1 Person Workspac..
PROPERTY OVERVIEW $92pw Price incl. 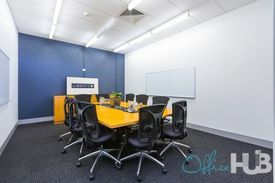 Brand new serviced office in convenient Burswood with fab meeting facilities and a range of flexible options. Set to open its doors in August 2018, this coworking centre comes from a local provider that has grown into one of the city’s leading office specialists, best known for its impeccable customer service. This refurbished and light filled centre comprises private offices, coworking desk spaces and three purpose built meeting rooms that you can book by the hour or day. There is a generous breakout and collaboration space which encourages organic networking and collaboration with some of Perth’s brightest minds. Included with the space as standard is personalised call handling and corporate grade internet while you also have access to printing, conferencing equipment, networking events and business support services. Short and long term options available on flexi terms so your space can grow with you – book a tour or contact Office Hub and we’ll help you get the best deal on your chosen space. This convenient location on Burswood Road hits the sweet spot of being close enough to the city that clients are always within reach while also having good parking options and easy road links. Burswood is a high growth area and this quality 3.5 Star NABERS Energy rated building enjoys a prominent position opposite the BMW showroom. Recently refurbished, everything feels fresh and new including the great facilities of showers and bike racks. Drive just five minutes or hop on a bus at Victoria Park bus station and you’ll be right in the middle of Perth close to multinational corporations, resource firms and innovative startups in the city’s vibrant business scene. Optus Stadium and Crown Resort & Casino are also only five minutes away and the Canning Highway provides a direct route to Fremantle and the Freeway. Perth International & Domestic Airport is 9km away and serviced by a regular 30 minute shuttle bus making this space perfect for frequent business travellers. The advertised office space is perfect for a team of 1. If you need more or less space, we have over 30,000 furnished workspaces all over the world suitable for a team of 1 to 200+. Our award winning team offer a free service that will help you find the perfect solution for your needs, so reach out if you need more help. What you get for your weekly rent , 24/7 Access , 24/7 Security , Access to internal breakout areas , Access to kitchen facilities , Access to secure printer and scanner , Building outgoings included , Electricity usage included , Flexible terms , One simple bill for everything related to your workspace , Plug and play furnished workspace , Regular cleaning , Secure high speed Internet , Your own receptionist and waiting area for your clients Building features , Abundance of natural light , Air conditioning , Car parking in building (Paid) , Company branding in foyer , Disabled access and facilities , Onsite Cafe / Restaurant , Print, scan and copy facilities , Taxi / Uber stand close to building 600m to Telethon Community Cinemas Burswood 300m to Charles Paterson Park 270m Burswood Seafood market 1.1km to Burswood Railway Station & 1.3km to Victoria Park Railway Station 4.3km to Perth CBD WHO IS OFFICE HUB? Office Hub has largest collection of shared office space, sublet office space, creative coworking office space and serviced offices, perfect for 1 200 employees. Let us take you on a tour of all the spaces that fit your needs and budget. Our service is complimentary and we work for you and the landlord to negotiate the most competitive deal in the market. Let us show you how shared and serviced offices can be the perfect solution for your business. www.office hub.com.au www.office hub.co.nz Conditions apply A portion of the square meterage factors in access to shared space. The advertised price includes any incentives offered based on a 12 month agreement. If a shorter period is agreed to please note the price may increase accordingly. This promotional offer for new tenants only and may be withdrawn at any time due to space availability. Abundance Of Natural Light | Regular Cleaning | Cafes And Shops Nearby $342pw | 3 Person Workspa..
PROPERTY OVERVIEW $342pw Price incl. 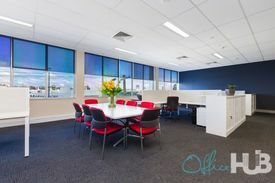 Brand new serviced office in convenient Burswood with fab meeting facilities and a range of flexible options. Set to open its doors in August 2018, this coworking centre comes from a local provider that has grown into one of the city’s leading office specialists, best known for its impeccable customer service. This refurbished and light filled centre comprises private offices, coworking desk spaces and three purpose built meeting rooms that you can book by the hour or day. There is a generous breakout and collaboration space which encourages organic networking and collaboration with some of Perth’s brightest minds. Included with the space as standard is personalised call handling and corporate grade internet while you also have access to printing, conferencing equipment, networking events and business support services. Short and long term options available on flexi terms so your space can grow with you – book a tour or contact Office Hub and we’ll help you get the best deal on your chosen space. This convenient location on Burswood Road hits the sweet spot of being close enough to the city that clients are always within reach while also having good parking options and easy road links. Burswood is a high growth area and this quality 3.5 Star NABERS Energy rated building enjoys a prominent position opposite the BMW showroom. Recently refurbished, everything feels fresh and new including the great facilities of showers and bike racks. Drive just five minutes or hop on a bus at Victoria Park bus station and you’ll be right in the middle of Perth close to multinational corporations, resource firms and innovative startups in the city’s vibrant business scene. Optus Stadium and Crown Resort & Casino are also only five minutes away and the Canning Highway provides a direct route to Fremantle and the Freeway. Perth International & Domestic Airport is 9km away and serviced by a regular 30 minute shuttle bus making this space perfect for frequent business travellers. The advertised office space is perfect for a team of 3. If you need more or less space, we have over 30,000 furnished workspaces all over the world suitable for a team of 1 to 200+. Our award winning team offer a free service that will help you find the perfect solution for your needs, so reach out if you need more help. What you get for your weekly rent , 24/7 Access , 24/7 Security , Access to internal breakout areas , Access to kitchen facilities , Access to secure printer and scanner , Building outgoings included , Electricity usage included , Flexible terms , One simple bill for everything related to your workspace , Plug and play furnished workspace , Regular cleaning , Secure high speed Internet , Your own receptionist and waiting area for your clients Building features , Abundance of natural light , Air conditioning , Car parking in building (Paid) , Company branding in foyer , Disabled access and facilities , Onsite Cafe / Restaurant , Print, scan and copy facilities , Taxi / Uber stand close to building 600m to Telethon Community Cinemas Burswood 300m to Charles Paterson Park 270m Burswood Seafood market 1.1km to Burswood Railway Station & 1.3km to Victoria Park Railway Station 4.3km to Perth CBD WHO IS OFFICE HUB? Office Hub has largest collection of shared office space, sublet office space, creative coworking office space and serviced offices, perfect for 1 200 employees. Let us take you on a tour of all the spaces that fit your needs and budget. Our service is complimentary and we work for you and the landlord to negotiate the most competitive deal in the market. Let us show you how shared and serviced offices can be the perfect solution for your business. www.office hub.com.au www.office hub.co.nz Conditions apply A portion of the square meterage factors in access to shared space. The advertised price includes any incentives offered based on a 12 month agreement. If a shorter period is agreed to please note the price may increase accordingly. This promotional offer for new tenants only and may be withdrawn at any time due to space availability. Abundance Of Natural Light | Regular Cleaning | Reception Services $456pw | 4 Person Workspa..
PROPERTY OVERVIEW $456pw Price incl. Brand new serviced office in convenient Burswood with fab meeting facilities and a range of flexible options. Set to open its doors in August 2018, this coworking centre comes from a local provider that has grown into one of the city’s leading office specialists, best known for its impeccable customer service. This refurbished and light filled centre comprises private offices, coworking desk spaces and three purpose built meeting rooms that you can book by the hour or day. There is a generous breakout and collaboration space which encourages organic networking and collaboration with some of Perth’s brightest minds. Included with the space as standard is personalised call handling and corporate grade internet while you also have access to printing, conferencing equipment, networking events and business support services. Short and long term options available on flexi terms so your space can grow with you – book a tour or contact Office Hub and we’ll help you get the best deal on your chosen space. This convenient location on Burswood Road hits the sweet spot of being close enough to the city that clients are always within reach while also having good parking options and easy road links. Burswood is a high growth area and this quality 3.5 Star NABERS Energy rated building enjoys a prominent position opposite the BMW showroom. Recently refurbished, everything feels fresh and new including the great facilities of showers and bike racks. Drive just five minutes or hop on a bus at Victoria Park bus station and you’ll be right in the middle of Perth close to multinational corporations, resource firms and innovative startups in the city’s vibrant business scene. Optus Stadium and Crown Resort & Casino are also only five minutes away and the Canning Highway provides a direct route to Fremantle and the Freeway. Perth International & Domestic Airport is 9km away and serviced by a regular 30 minute shuttle bus making this space perfect for frequent business travellers. The advertised office space is perfect for a team of 4. If that\'s not quite right, we have ready to use workspaces of all sizes all over the world and our free service will help you find the perfect solution for your needs. What you get for your weekly rent , 24/7 Access , 24/7 Security , Access to internal breakout areas , Access to kitchen facilities , Access to secure printer and scanner , Building outgoings included , Electricity usage included , Flexible terms , One simple bill for everything related to your workspace , Plug and play furnished workspace , Regular cleaning , Secure high speed Internet , Your own receptionist and waiting area for your clients Building features , Abundance of natural light , Air conditioning , Car parking in building (Paid) , Company branding in foyer , Disabled access and facilities , Onsite Cafe / Restaurant , Print, scan and copy facilities , Taxi / Uber stand close to building 600m to Telethon Community Cinemas Burswood 300m to Charles Paterson Park 270m Burswood Seafood market 1.1km to Burswood Railway Station & 1.3km to Victoria Park Railway Station 4.3km to Perth CBD WHO IS OFFICE HUB? Office Hub has largest collection of shared office space, sublet office space, creative coworking office space and serviced offices, perfect for 1 200 employees. Let us take you on a tour of all the spaces that fit your needs and budget. Our service is complimentary and we work for you and the landlord to negotiate the most competitive deal in the market. Let us show you how shared and serviced offices can be the perfect solution for your business. www.office hub.com.au www.office hub.co.nz Conditions apply A portion of the square meterage factors in access to shared space. The advertised price includes any incentives offered based on a 12 month agreement. If a shorter period is agreed to please note the price may increase accordingly. This promotional offer for new tenants only and may be withdrawn at any time due to space availability. PROPERTY OVERVIEW $456pw Price incl. Brand new serviced office in convenient Burswood with fab meeting facilities and a range of flexible options. Set to open its doors in August 2018, this coworking centre comes from a local provider that has grown into one of the city’s leading office specialists, best known for its impeccable customer service. This refurbished and light filled centre comprises private offices, coworking desk spaces and three purpose built meeting rooms that you can book by the hour or day. There is a generous breakout and collaboration space which encourages organic networking and collaboration with some of Perth’s brightest minds. Included with the space as standard is personalised call handling and corporate grade internet while you also have access to printing, conferencing equipment, networking events and business support services. Short and long term options available on flexi terms so your space can grow with you – book a tour or contact Office Hub and we’ll help you get the best deal on your chosen space. This convenient location on Burswood Road hits the sweet spot of being close enough to the city that clients are always within reach while also having good parking options and easy road links. Burswood is a high growth area and this quality 3.5 Star NABERS Energy rated building enjoys a prominent position opposite the BMW showroom. Recently refurbished, everything feels fresh and new including the great facilities of showers and bike racks. Drive just five minutes or hop on a bus at Victoria Park bus station and you’ll be right in the middle of Perth close to multinational corporations, resource firms and innovative startups in the city’s vibrant business scene. Optus Stadium and Crown Resort & Casino are also only five minutes away and the Canning Highway provides a direct route to Fremantle and the Freeway. Perth International & Domestic Airport is 9km away and serviced by a regular 30 minute shuttle bus making this space perfect for frequent business travellers. The advertised office space is perfect for a team of 4. If you need more or less space, we have over 30,000 furnished workspaces all over the world suitable for a team of 1 to 200+. Our award winning team offer a free service that will help you find the perfect solution for your needs, so reach out if you need more help. What you get for your weekly rent , 24/7 Access , 24/7 Security , Access to internal breakout areas , Access to kitchen facilities , Access to secure printer and scanner , Building outgoings included , Electricity usage included , Flexible terms , One simple bill for everything related to your workspace , Plug and play furnished workspace , Regular cleaning , Secure high speed Internet , Your own receptionist and waiting area for your clients Building features , Abundance of natural light , Air conditioning , Car parking in building (Paid) , Company branding in foyer , Disabled access and facilities , Onsite Cafe / Restaurant , Print, scan and copy facilities , Taxi / Uber stand close to building 600m to Telethon Community Cinemas Burswood 300m to Charles Paterson Park 270m Burswood Seafood market 1.1km to Burswood Railway Station & 1.3km to Victoria Park Railway Station 4.3km to Perth CBD WHO IS OFFICE HUB? Office Hub has largest collection of shared office space, sublet office space, creative coworking office space and serviced offices, perfect for 1 200 employees. Let us take you on a tour of all the spaces that fit your needs and budget. Our service is complimentary and we work for you and the landlord to negotiate the most competitive deal in the market. Let us show you how shared and serviced offices can be the perfect solution for your business. www.office hub.com.au www.office hub.co.nz Conditions apply A portion of the square meterage factors in access to shared space. The advertised price includes any incentives offered based on a 12 month agreement. If a shorter period is agreed to please note the price may increase accordingly. This promotional offer for new tenants only and may be withdrawn at any time due to space availability. Abundance Of Natural Light | Regular Cleaning | Cafes And Shops Nearby $684pw | 6 Person Workspa..
PROPERTY OVERVIEW $684pw Price incl. Brand new serviced office in convenient Burswood with fab meeting facilities and a range of flexible options. Set to open its doors in August 2018, this coworking centre comes from a local provider that has grown into one of the city’s leading office specialists, best known for its impeccable customer service. This refurbished and light filled centre comprises private offices, coworking desk spaces and three purpose built meeting rooms that you can book by the hour or day. There is a generous breakout and collaboration space which encourages organic networking and collaboration with some of Perth’s brightest minds. Included with the space as standard is personalised call handling and corporate grade internet while you also have access to printing, conferencing equipment, networking events and business support services. Short and long term options available on flexi terms so your space can grow with you – book a tour or contact Office Hub and we’ll help you get the best deal on your chosen space. This convenient location on Burswood Road hits the sweet spot of being close enough to the city that clients are always within reach while also having good parking options and easy road links. Burswood is a high growth area and this quality 3.5 Star NABERS Energy rated building enjoys a prominent position opposite the BMW showroom. Recently refurbished, everything feels fresh and new including the great facilities of showers and bike racks. Drive just five minutes or hop on a bus at Victoria Park bus station and you’ll be right in the middle of Perth close to multinational corporations, resource firms and innovative startups in the city’s vibrant business scene. Optus Stadium and Crown Resort & Casino are also only five minutes away and the Canning Highway provides a direct route to Fremantle and the Freeway. Perth International & Domestic Airport is 9km away and serviced by a regular 30 minute shuttle bus making this space perfect for frequent business travellers. The advertised office space is perfect for a team of 6. If you need more or less space, we have over 30,000 furnished workspaces all over the world suitable for a team of 1 to 200+. Our award winning team offer a free service that will help you find the perfect solution for your needs, so reach out if you need more help. What you get for your weekly rent , 24/7 Access , 24/7 Security , Access to internal breakout areas , Access to kitchen facilities , Access to secure printer and scanner , Building outgoings included , Electricity usage included , Flexible terms , One simple bill for everything related to your workspace , Plug and play furnished workspace , Regular cleaning , Secure high speed Internet , Your own receptionist and waiting area for your clients Building features , Abundance of natural light , Air conditioning , Car parking in building (Paid) , Company branding in foyer , Disabled access and facilities , Onsite Cafe / Restaurant , Print, scan and copy facilities , Taxi / Uber stand close to building 600m to Telethon Community Cinemas Burswood 300m to Charles Paterson Park 270m Burswood Seafood market 1.1km to Burswood Railway Station & 1.3km to Victoria Park Railway Station 4.3km to Perth CBD WHO IS OFFICE HUB? Office Hub has largest collection of shared office space, sublet office space, creative coworking office space and serviced offices, perfect for 1 200 employees. Let us take you on a tour of all the spaces that fit your needs and budget. Our service is complimentary and we work for you and the landlord to negotiate the most competitive deal in the market. Let us show you how shared and serviced offices can be the perfect solution for your business. www.office hub.com.au www.office hub.co.nz Conditions apply A portion of the square meterage factors in access to shared space. The advertised price includes any incentives offered based on a 12 month agreement. If a shorter period is agreed to please note the price may increase accordingly. This promotional offer for new tenants only and may be withdrawn at any time due to space availability. Refurbished Office/showroom + Warehouse REDUCED!! Warehouse Office/showroom - Prime Exposure REDUCED!! 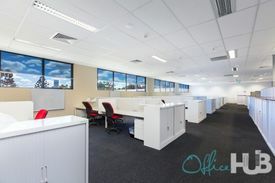 Total area 463sqm (Warehouse Office) Rent: $69,450pa plus Outgoings (approximately $26,581pa) plus GST Owner is willing to provide incentives for the right tenant and terms FEATURES INCLUDE; Dual rear roller doors Prime exposure to Burswood Road Exclusive parking to front and rear of property Newly refurbished from October 2014 2 x disabled toilets and wheelchair access ramp Air conditioning and insulated roofing Lighting and floor coverings Located near Albany Hwy, Canning Hwy and Great Eastern Hwy 117B (232sqm) next door, is also available CALL NOW TO VIEW!